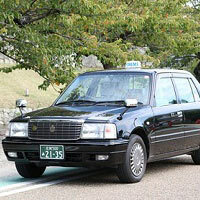 By Taxi: Outside the station’s north gate, you should see several black or white taxi cabs. 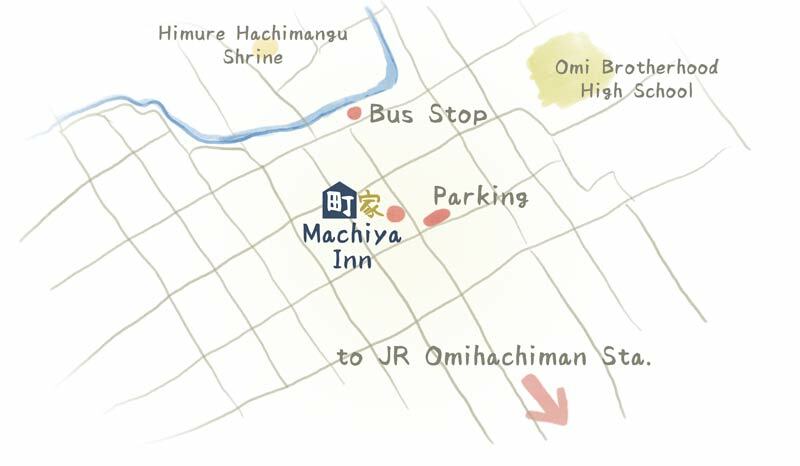 If your driver isn’t familiar with Machiya Inn, you can show them our address on Google Maps. The ride should be just 3 to 5 minutes. 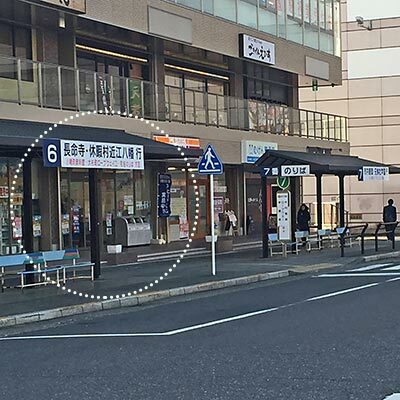 By Bus: Exiting the station’s north gate, bus stops are just outside on your left. 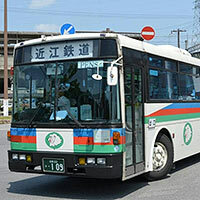 Take the Omi Railway Bus (近江鉄道バス), Bus No. 6 (bus terminal photo ). Get off at the Osugi-cho (大杉町) Bus Stop (bus stop photo ). The stop is just before an intersection. 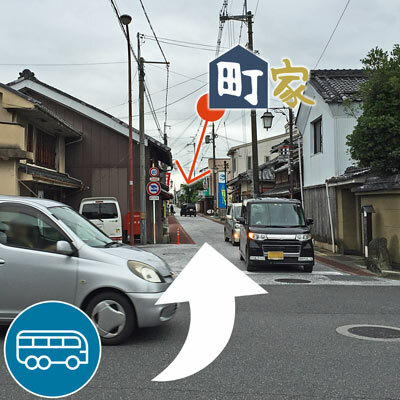 Turn left at this intersection, and Machiya Inn is 1.5 blocks down on the right side (photo from intersection ). From the Meishin Expressway, the nearest interchanges are Yokaichi and Ryuo. We’re about 30 minutes from both. See Google Map directions for one possible route. Free parking available at our designated lot across the street. If you plan on parking, please tell us beforehand via email so we can ensure space availability. We can also accommodate bike and motorcycle parking on-premise. Please inquire before arrival. Use one of our rental bicycles to explore the town! 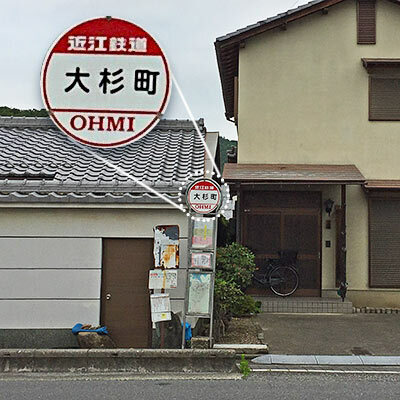 But actually you may not even need them since the popular tourist areas of Omihachiman are mostly within walking distance. Our surrounding neighborhood is full of historic structures, some now serving as cafes, museums, and other interesting attractions. 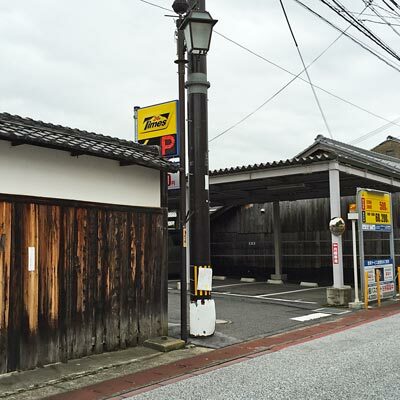 The area was once a rich and thriving district of the famous Omi-Shonin merchants, so many of these local historical building were built by the successful merchants of the region. Some visitors also come to see the buildings of early 20th century American architect, William Vories, who lived here for most of his professional life and designed several nearby buildings. 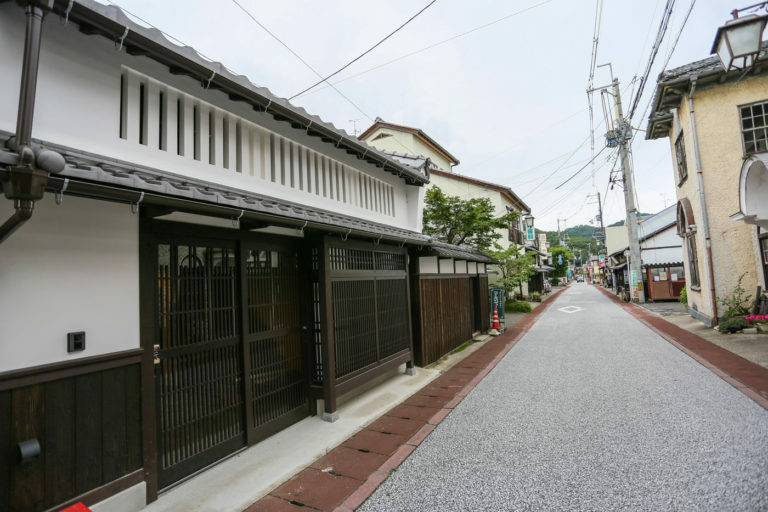 If you decide to take a rental cycle for the day, you can explore a little further, perhaps a ferry to Okishima, the small island in Lake Biwa, the mountain park of the Azuchi Castle ruins, or a relaxing ride through the canal of Suigo Meguri. 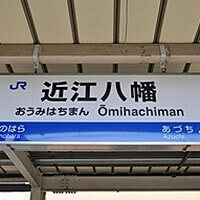 For more ideas of places to go, here are TripAdvisor’s rankings for Top 100 things to do in Omihachiman. Most of the Top 10 are all right around our neighborhood such as Himure Hachiman-Gu Shrine and the Hachiman-Bori historic moat. This area is also used as a shooting location for historic dramas recently as the historic neighborhood is very well preserved.